Last Summer, while getting the house ready to transfer to the new owners, I ran into a problem with paint. As usual, I had been somewhat lazy in labeling my paint cans previously that year when I painted several rooms various shades of light to medium brown while I was in my frenzied search for the "perfect" shade of brown. The guest bathroom was a medium shade of brown and behind a picture I had made several ugly attempts to hang the picture. Well, I went out to the cabinet that had many cans of light to medium brown paint (both gallon, quart, samples and pints), and searched for the one that matched the guest bath. Each time I thought I'd found the right shade and went and painted the spot, but alas, not so! The mismatched spot got bigger and bigger each time I tried to cover it. Finally, I gave up and decided I would either have to paint 2 walls of the bathroom or just leave the mess and try to hide it with the picture. Like all good slackers, to avoid making a decision I got down on the floor to clean it really well and happily discovered a quarter-size paint blob behind the door. "Thank God I'm a sloppy painter" was all I could think! I hurried down to Home Depot and handed the paint blob to the clerk at the paint desk. He put it into their computerized paint-matching machine and out came a sample of perfectly matched paint. YAY! You just need a quarter-size sample to get paint matched. Too bad it isn't that easy to correct my "too-blonde" hair color I ended up with last time I was brave enough to let the beauty shop do it. I'll have to think up how I'm going to correct that coloring, but first I need to relax a little. It will help if you remember where you put them, but that's a whole 'nother story. Not a dock, but "The Dock". Getting there is half the fun. You'd have to load up in the pickup truck like Grampy's cousin Harold, his wife Darla, Grampy, Pop, and I did one Saturday night. Notice Harold is the only one brave enough to ride shotgun when Grampy is driving! Darla, Pop and I rode in the back seat and prayed. You may think we're pulling your leg when we start down the back roads between the Texas and Oklahoma border. It may seem a little isolated to be heading toward a "hot spot" for dining. You'll think we're joking when we tell you we have to line up behind that red jeep to wait for the cars on the other side of the one lane bridge to come across. Our side is Texas, the other side is Oklahoma. No one patrols this "border" either, even though both states think the other side is a strange land. Finally the last car from the other side will come across and it'll be our turn to go. Keep your eyes ahead and hope no one on the Oklahoma side decides they don't want to wait for our line of cars to cross. There's only room for one car to cross at a time and our big pickup barely makes it. Don't look out the window, the bridge seems a little shaky and it's a long way down! When we finally arrive, you'll wonder where in the world we are. Look past the parking lot and all you can see are cow pastures...you'll wonder if we're joking you. When we tell you The Dock is only open on Friday and Saturday nights and is packed if you wait to late to come, you'll think you've gone back to the 1930's. But come inside and you'll love the food. This is no ordinary buffet. You'll find homemade bread and rolls, soups, salads, baked potatoes with the works, boiled - fried - and garlic shrimp, fried catfish, yummy fried chicken (pass me a wing please), pinto beans, and hot and fresh peach and blackberry cobbler fresh out of the oven. I could go on and on, but you get the picture. Being that Darla is the smallest of the group, I didn't believe her when she said she can eat her weight in boiled shrimp. She proved to me she could! Harold and Pop gave up and just watched Darla in amazement. "How many plates of shrimp is that Darla?" I asked. She's raising 3 fingers in the picture, but this wasn't the end of her feast by a long shot. Me, I was soon up at the buffet line waiting for them to switch the empty pan of peach cobbler out for a pan of hot blackberry...mmmmmmmm. I love blackberry cobbler! And I admit, I couldn't keep up with little Darla if I tried. So, come visit. If you're brave enough to make the ride over the bridge with Grampy, there's a mess of the freshest shrimp just waiting for ya! Four of our family members have birthdays in December. My father was born on this date -- December 13Th. He has been gone a long time, but I always think of him on this day and I often know his spirit is around because he sends me little reminders, always connected to the number "13". 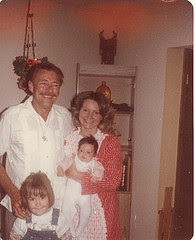 Here's a picture of Dad, my two oldest daughters and me, taken in the days when my "Farrah Fawcett" hairdo was actually in style! Next in age is my younger sister, Cindy, born on the 5Th. Cindy never misses a chance to call Gampy or me on our birthday (usually as early as possible) to sing "Happy Birthday!" and we always try to return the favor, again...as early as possible. Cindy is the one in orange in the picture below. 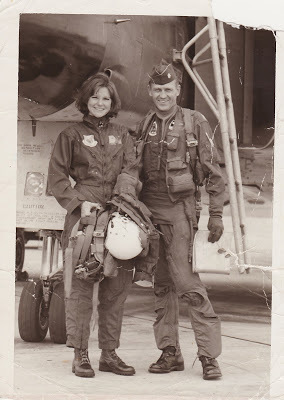 This picture was taken when I was in the Air Force and home on leave in 1969. Cindy had just turned 12, I was 19, sister Becky was 9 and little Tori was 22 months. 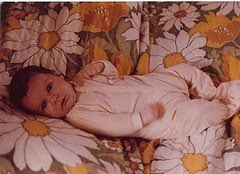 My first born, Jenny, was born on the 7Th and, as you can see, she was a beautiful baby. The picture below was taken at 2 weeks old. She looked like a 3 month old at that point. I think it was because she was overdue by almost 2 weeks. See how the size 0 to 3 month size sleeper was already too short for her torso? When she was born she was 8 lbs 14 oz and not a wrinkle on her face. 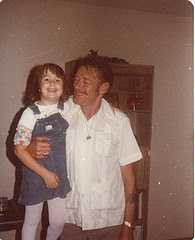 Here's Jenny and Dad together. This is one of my favorite pictures of my Dad because he had just had a lung removed and it made us realize that life is short and not to be wasted. 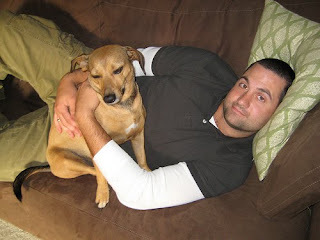 The youngest of our December birthdays is our son-in-law Mike. He became a father this year when Ben was born, but Doggy Dee has called him Daddy for years. 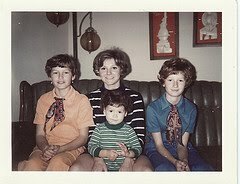 Sadly, in 1969, my father's mother died on Dec 9Th and was buried on Dad's birthday -- Dec 13Th -- that year. Her name was Sabra. When Jenny was born 4 years later just a few days shy of the day Grandma died, we gave her the middle name Sabra in memory of my grandmother. 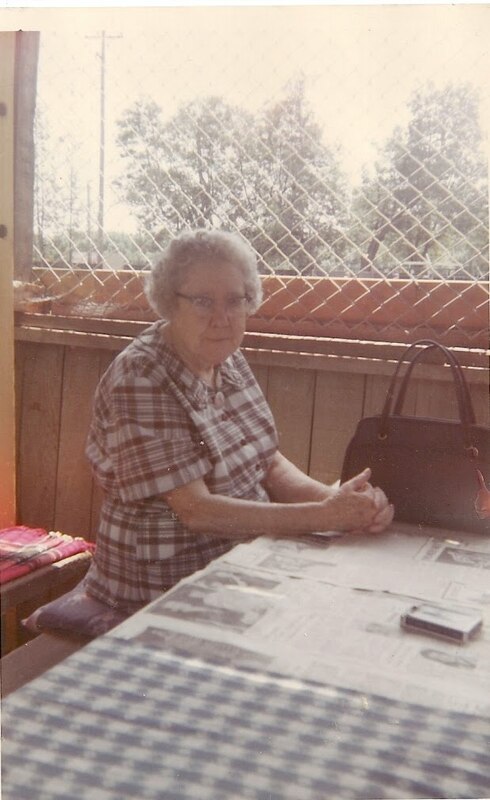 The thing I loved about Grandma Sabra was her spirit -- And, how she loved to play penny-ante-poker. Notice there's a deck of cards on that table in front of her. 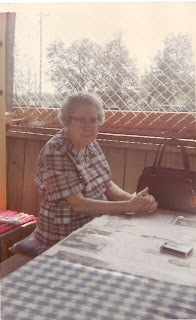 Her favorite game was "Aces, Deuces, Jokers and 1-Eyed-Jacks Wild". As a kid, I thought this was a great game and never questioned the sanity of it. But when I was an adult and explained how to play it to a group of guys, one of them pointed out that the majority of the cards in the deck were wild. That was so like Grandma. She loved to win and with that many wild cards, she usually did! So Happy Birthday again to all you December babies. Especially happy birthday to you Dad, on your birthday today. Please know that you are missed... I hope Grandma Sabra is letting you win a few pots in the penny-ante poker games up there. This is the house that has stolen Gampy's heart. I call it the castle on the hill. See, I really like a little Country-French farmhouse that's being built down below. The castle is done and ready to move in. The farmhouse is still being built. But "we" have ruled out the farmhouse because Gampy thinks the extra bedrooms are too small. Inside the door is a hallway. We would convert the archway to the left to a built-in bench and shelves for taking off shoes and hanging coats (a sort of mini mudroom) and wall in the archway so that the dining room would become a TV room. There's another dining area and one is enough for us. Our last house had a dining room we used once a year at Thanksgiving. I love the doorway trim. This builder is the tops in my opinion. His wife is the interior designer and she did a lovely job. The paint is much darker than it appears. My cheapie camera seems to wash things out. Here's what is now the dining room, but would be closed up with french doors and built in shelving and a spot to hang a TV on the wall. The chandelier is old and was redone for wiring. Love it of course. This kitchen stole my heart. Gampy found his spot and was ready to close right then and there. Let's get rid of the guys and focus on the kitchen. The tile is lovely and I think I could look like a real good cook here. I didn't say "would be", I said "look like". That would be enough for me. There's a little room on the way to the master bedroom. No door, just built in office stuff. Man, I could actually get organized here...hmmm. This picture makes the granite look "orange-y", but it's not. The decorations used for staging are not my style, but I would take care of that in an hour. Here's the thing that won me over with this builder. We always talk about building in shelves and drawers, but never find the money or time to get it done. Imagine buying a house where the builder thought of everything for you. That's why I love this builder/designer team. Maybe a castle on a hill is just what I need too. My big fear is who is going to mow all that grass since it sits on a corner...lots of mowing and edging...and I usually end up with that job! What do you think? I'll show the farmhouse next time even tho it's already crossed off the list. There is a special wall I want to show you. Gampy's cousin Harold was quite a "rounder" when he was young and gave his parents many sleepness nights. Payback is hell! Harold's mama, Jane, is a true Texas woman with a mind of her own...even in her 80's. Here's Harold making his 10th phone call of the day trying to track down his wayward mother, who apparently wasn't answering her cell phone after she decided to drive herself up to Oklahoma for Thanksgiving with her sister's family. The 4-hour trip didn't worry her at all, but Harold was another story. We got quite a kick out of watching Jane's once "wild" little boy call several relatives in Oklahoma trying to track his mother down and make sure she got there OK.
Making calls, checking his watch... we wonder if his mama is getting the last laugh by turning the tables on her once wayward son? Ever Wished You Hadn't Asked The Questions? Gampy: "Wow, Mary Hardin Baylor's football team blew out the final game of the season with the college in Kentucky. They're now a division three college." Me: "What's a division three?" Gampy: "It's the 3rd one." Me: "yeah, but is three better or worse? Like...is one the best or is three the best?" Gampy: "Well, there's three sizes of college. Division 1, division 2, and division 3. They are in division...."
Contrary to our family's opinion, the worse cook I ever knew is not my daughter Jaysa, but a friend name Tina. Tina was such a bad cook, her husband Chet would not eat anything she cooked. One time I made some great fudge and I gave Tina a plate of it to take home. I worked with Chet, and several days later when Chet still hadn't commented on the great fudge, I finally asked how he liked it. Turns out he hadn't eaten any because he thought Tina was trying to trick him into eating something she made! "Sharon, do turkeys have necks?" "yes...why do you ask Tina?" "Because I have my hand up the turkey and I feel something long and stiff. Chet says it's a neck, but I'm not pulling it out until I know for sure!" Are these not the cutest little pink slipper-boots? They look big in the picture, but they're only a toddler size 7. I was at my favorite store - Walmart - last week, and while I usually try to avoid the little girls section, these little slippers pulled me in. See, I raised three daughters and money was always tight back then, so I didn't get to buy them all the "girly-girl" stuff I would've liked to. Now, when I go by the little girls department, I get suckered in real easy! Once the slippers pulled me in, these little pink "high tops" called my name too... or should I say Little Lily's name? She loves to wear tennies, even with her dresses. Of course, next to the shoes were the little leggings and tops. At $3.50 a piece they were too cheap to pass up. Especially cute was a little black shirt with a red candy cane on it and black sparkle leggings. I got back home and decided to put the pile into a mailing envelop so I could get it in the mail before I forgot to send them. I tried and tried, but not everything would fit. But I did get the package in the mail last Friday and I'm looking forward to seeing if the high-tops are a hit. Unfortunately, still sitting on my table are the little slippers that started it all. I told you not everything would fit! Dang...I need to get them in the mail before they talk me into buying something else. Lots of bloggers are apparently good cooks, unfortunately I'm not. But I can mix stuff up to create a homemade taste. We eat out a lot, but lately I've been trying to eat at home simply because it's healthier and has more fiber. Start with a can of cherry pie mix and a can of cherries. Mix them together. Put the mixture in a baking dish. For the topping: mix a half cube of softened butter, about 1/3 cup of flour and 2/3 cup of oatmeal. Add enough light brown sugar to make you satisfied with the sweetness of it. We tend to use less than most people would, so you be the judge. If pressed for an exact amount, I'd say 1/3 of a cup of brown sugar. Slop this mixture in globs randomly around the top of the cherry mixture. Bake at about 350 for about 30 mins, or until the cherries are bubbling and the crumbled top is light brown. Add some ice cream if you like. We like it best hot out of the oven. You get the picture.